New Zealand is a country full of incredible things to see and do – from sprawling lakes and snow capped mountains to black sand beaches and world class surfing. 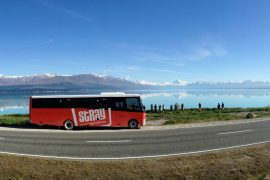 If you’re trying to experience the best of what New Zealand has to offer then the Short Max Pass with Stray New Zealand is for you! 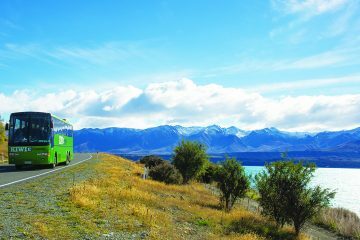 This epic hop on, hop off bus pass takes in heaps of both the North and South Island – from backpacker favourites like Queenstown, Rotorua and Franz Josef to more off the beaten track destinations like Raglan, Whakahoro and Te Araroa. With a minimum travel time of 21 days and a maximum travel time of 12 months you can tailor it to suit your own time scale and travel plans. 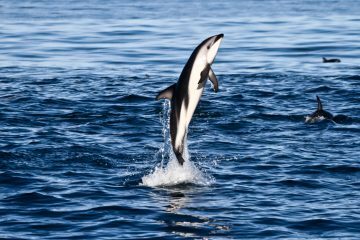 Fallen in love with Kaikoura? Extend your stop off! Waves pumping in Raglan? Stay as long as the swell does! Stray New Zealand also includes heap of awesome free activities en route too – such as snorkelling, dune surfing, scenic walks, kayaking and Maori blessings, so its much more than just a bus trip! Explore new places, meet some amazing new travel buddies and soak up all the goodness that New Zealand has to offer! Accommodation: Exclusive Stray accommodation by the waterfront. Optional paid activities: Kayaking, scuba diving, bike hire, glass bottom boat tour. Accommodation: An eco-lodge, near the beach set in native bush. Free activities: Walk to the waterfall, bush walk around Mt Karioi, beach walk, glow-worm spotting in the bush, West Coast sunset, Inspiration Point. Unique Stray Experience: The Lake Aniwhenua overnight experience is $95, which includes comfortable lodge accommodation, a guided tour to sacred Maori rock carvings, a Marae experience, afternoon tea, delicious ‘Hangi’ dinner and buffet breakfast, participation in an altruistic community program. Optional paid activities: Taupo: skydiving, bungy. Free activities: Huka Falls, Spa Road walk. Optional paid activities: An eco-warrior 4WD tour, a one day horse trek, clay bird shooting, kayaking, jet boating, pest control. Free activities: Walk around the truly amazing property at Whakahoro and take in the lush scenery, walk to the Kaiwhakauka waterfall, enjoy your hosts’ fantastic hospitality and stories of the local wildlife and history. 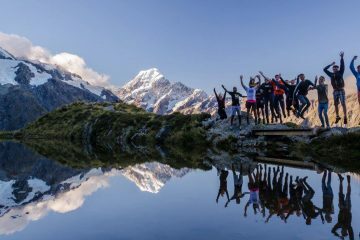 Optional paid activities: The Tongariro Alpine Crossing. Free activities: Taranaki Falls walk, visit the Volcanic Centre, Tawhai Falls (Gollum’s pool). Optional paid activities: Check out some of the great cafes and bars. Free activities: Walk Oriental Parade, head up Mt Victoria for fantastic views, visit Te Papa National Museum, gumboot (welly) throwing. Accommodation: Unique Stray accommodation on the edge of the national park. Optional paid activities: Wine tasting, skydiving. Free activities: Walks, mussel tasting around the fire, stargazing. Optional paid activities: Full day sailing trip, kayaking, skydiving, water taxi, stand-up paddle boarding, canyoning, hang gliding, scenic microlight flight. Accommodation: Charming character villa in the centre of town. Optional paid activities: Surfing, caving, craft brewery tour. Free activities: Westport seal colony, West Coast sunset, Truman Track walk. Accommodation: Lodge in the middle of the rainforest. Optional activities: Save some coin today! Free activities: Punakaiki Pancake Rocks and the mighty blowholes, walk along the beach. 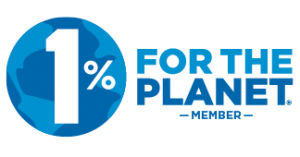 Optional paid activities: The ‘Ice Explorer’ Trip – a short heli-hop onto the glacier followed by an educational tour (entry to hot pools included), kayaking, skydiving. Accommodation: Central hostel close to all the action. Optional paid activities: Puzzling World, skydiving, bungy jumping, mountain biking, pilot your own stunt plane or learn to fly and take a friend for free. Optional paid activities: Any adventure activity that we mad Kiwis can dream up (bungy, swing, jet boating, skydiving, mountain biking, zipline, horse riding…). Optional paid activities: Argo tour of alpine region, visit the Sir Edmund Hillary Alpine Centre. Accommodation: Purpose built backpackers near the city centre. Optional paid activities: Rangitata River rafting (late September – late March only). Free activities: Take photos of stunning scenery, go for a walk around central Christchurch. Accommodation: Comfortable hostel in the heart of sunny Nelson. Optional paid activities: Sample local wines and craft beers. Free activities: Centre of New Zealand walk on Botanical Hill. Accommodation: Central Wellington hostel or cosy villa in Picton. Free activities: Explore Wellington city, go fishing/mountain biking in Picton. 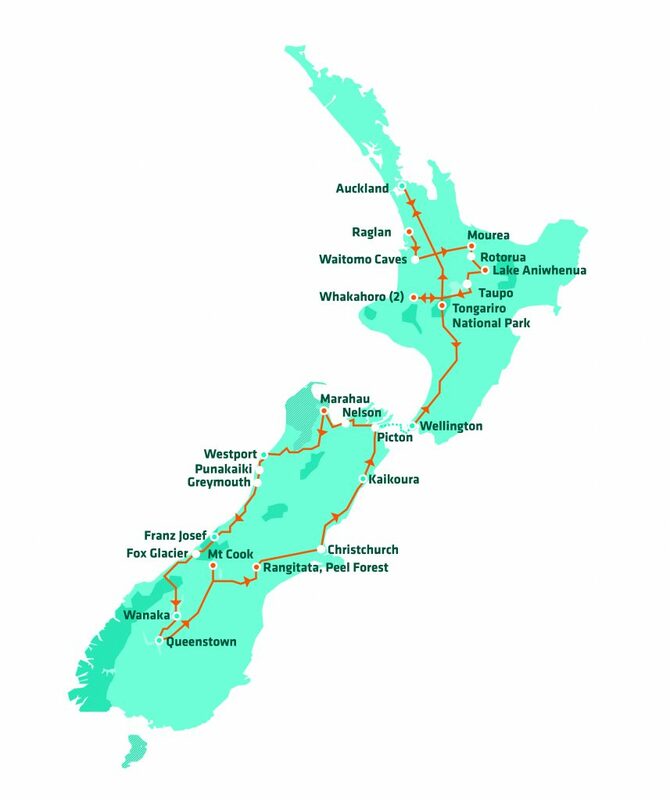 *This Pass can start or finish anywhere on this route, however most people start/finish in Auckland. Stay at a wilderness lodge in the bush at Raglan – overlooking New Zealand’s premier surf beach. See glow-worms and do some amazing caving at Waitomo Caves. Overnight stay on a Marae (Maori meeting house) in Mourea (accommodation, hangi dinner, breakfast and unique cultural experience all for only $80). Discover history and culture not yet touched by the hand of commercialism at our exclusive stop at Lake Aniwhenua. Stop in at Rotorua to experience (smell) the geothermal activity and do extreme white water rafting. Tongariro National Park (home to the ‘Lord of the Rings’ volcanoes and NZ’s best one day walk the ‘Tongariro Alpine Crossing’). Stay at award-winning conservation stop Whakahoro for wild, wilderness activities! Wellington – NZ’s capital city, home to our national museum Te Papa. 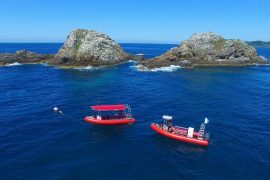 Unique overnight and a free day in Abel Tasman National Park (walks, sailing and kayaking options in this stunning area). Experience the remote and rugged West Coast. Majestic Franz Josef glacier with a free day to hike and explore it. Spend a few days in Queenstown – the adventure and party capital of NZ! Stay at base of NZ’s highest mountain Aoraki/Mt Cook. 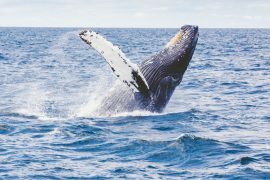 Visit Kaikoura, for the awe-inspiring whale watching and wildlife spotting. Most travellers start this pass in Auckland. See the Timetable tab for all other departure days and times. Auckland Northbound: Mondays, Tuesdays (Summer-only), Wednesdays, Thursdays and Saturdays. Auckland Southbound: Tuesdays, Wednesday (Summer-only), Thursdays, Saturdays and Sundays (Spring-only). All bookings must be re-confirmed at least 48 hours in advance. Please contact us on 0064 9 5262149 or support@straytravel.co.nz or visit our Stray Retail branch at 50 Fort Street, Auckland City. For Stray Hop-on Hop-off travel passes, Stray Journeys and Stray Adventures. Please note our terms and conditions are subject to change so please check our website for the latest version.